Adult $115.50: Retail Price $134.50 | You Save $19.00! 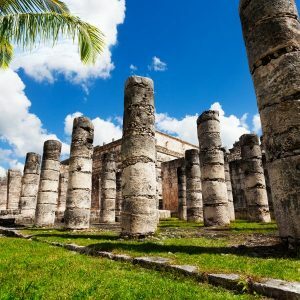 This Chichen Itza & Ek Balam tour from Tulum packs a lot in, so you’ll certainly get your money’s worth. 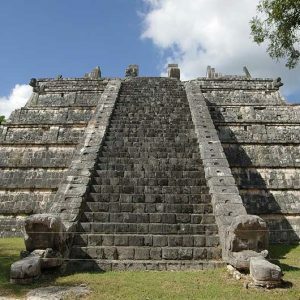 Our first port of call is the must-see Chichen Itza ruins, home to the world-famous Kukulkan pyramid. 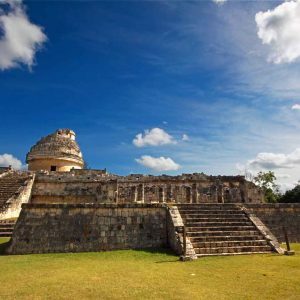 After an in-depth guided tour and some time to explore the ruins for yourself, we’ll then move on to Ek Balam, another notable Mayan settlement that’s steeped in history. 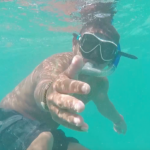 Also included is a much needed a dip to cool down in the famous Ik Kil cenote, a natural underground lagoon that’s a popular spot for tourists. All this adds up to an unforgettable day of excitement and adventure! Your day begins with collection from our special Tulum pickup loacation in our air-conditioned bus, to take you in comfort on your voyage towards the historic Chichen Itza ruins. Centuries ago, this place was home to a sprawling metropolis, and archeologists believe that it may have formed the capital of not one, but two empires in its heyday. Many of the buildings are still standing today, including, of course, the Kukulkan pyramid- one of the Seven New Wonders of the World. It stands as an architectural version of the Maya calendar, and would have been hugely important both for religious rituals- including human sacrifices- and day to day life. Your expert guide will tell you all about what life may have been like here at the city’s peak, and there’s plenty of ancient artwork to see that gives us some insight into Mayan life and culture. There are a whole host of decorated temples and plazas, along with stunning sculptures which still resonate with viewers today. Once the tour is complete, you’ll then have some free time to wander through the ruins yourself, and discover historic tombs and carvings. 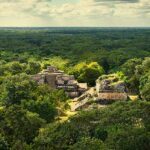 Our tour will also take us around 30 miles north, to the ruins of Ek Balam. A refreshing change from the often crowded Chichen Itza, Ek Balam was only recently excavated and restored, so it’s got that classic “jungle ruin” feel that many tourists are looking for in excursions. 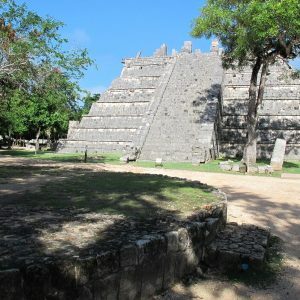 As with Chichen Itza, you’ll be taken on an Ek Balam tour to find out more about this mysterious city and its place as a royal seat of the Mayan empire. 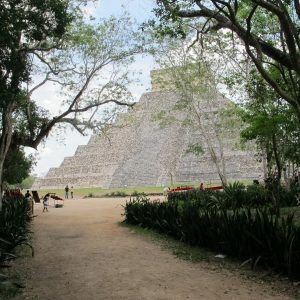 On the side of one of the pyramids, you can see the tomb of a real Mayan king, Ukit Kan Lek Tok’- one of the best preserved Mayan tombs in existence. Since these ruins are a little off the beaten track, you can even climb up the pyramids- a truly unforgettable experience! 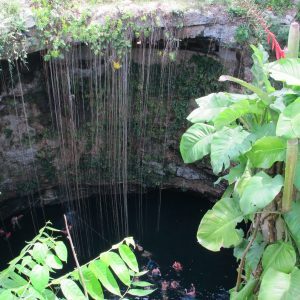 Also a stop off at the famous cenote Ik Kil is included on this tour. 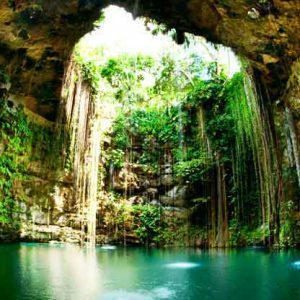 This sinkhole is a truly magnificent sight to behold, with vines and waterfalls flowing their way down to a glorious subterranean pool that makes for the perfect place to take a relaxing dip. 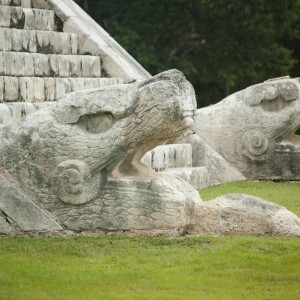 In keeping with the Mayan theme of our day, Ik Kil was sacred to the Mayans, and used for many rituals and ceremonies. Since then, though, things have changed somewhat, and it’s now a popular spot for cliff diving. Once the day is over, we will then take you back to Tulum again. 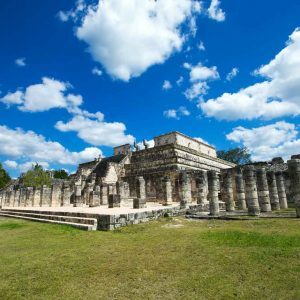 As you can see, this Chichen Itza & Ek Balam tour from Tulum is a day packed full of adventure, and is therefore not to be missed. Make sure you book your place on our next tour today! Pick up at Itours Hotel Mexico approx. 7:45 – 8:15 a.m., Tour returns between 7:15 – 7:45 p.m.